Photos are easy to take in Huntington Beach when so many great attractions and colorful landmarks exist in one place. Please enjoy looking at the pictures but do not copy them. They are copyright protected and are not permitted for use anywhere else. Thank you, STOCKTEAM.COM. 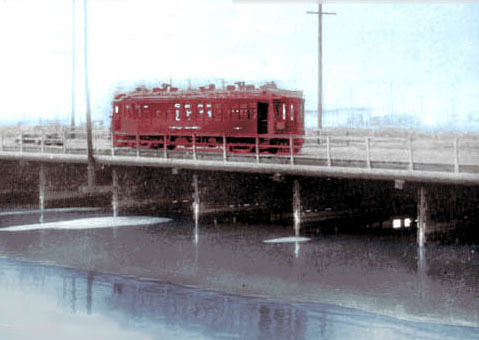 The Pacific Electric Red Car line was built in the early 1900s from Los Angeles to the beach cities. It brought folks from the city out to the beach to see the desirable living conditions and hopefully purchase land. See photo of one of the city's earliest Real Estate firms, Huntington Beach Realty. Developers were eager to sell beach property and knew that if there was a simple method for travel, visitors would be easily convinced to sign up for a house in a new tract along the coast. Huntington Beach renamed itself after Henry E. Huntington when the land baron with business acumen promised to run the electric car through the location rather than bypass it. Shortly afterwards, oil was discovered in the new "Huntington Beach" and the city grew around this industry. Today, you can visit a Red Car Museum that includes an actual Red Car. It is located only 2 miles from Huntington Beach in Seal Beach. Owned and operated by a nonprofit group, the piece of history is kept in pristine condition. Recent fundraising helped refurbish the wood portions of the car. If you have time to visit this great monument to history, it is located on Electric Street near Main and Pacific Coast Highway. Visit the Red Car Museum on the old Pacific Electric Right of Way. Car No. 1734 is a rare Pacific Electric tower car built in 1925 which serves as the museum headquarters. It was once a roving machine shop sent out to troubleshoot problems along the 40-mile Pacific Electric LA-Newport Line. A center tower was used for repairs and maintenance on the overhead lines. It operated for almost 50 years until 1950. The museum displays photographs of early Seal Beach, sea shells and Indian artifacts collected locally. It also has reference library of local history with detailed regional maps. Electric Avenue near Main St., next to Mary Wilson Library.